I love SQL Server and the productivity we used to get in SQL Server. It has so many useful function which increase the productivity of SQL Developer. Today is Sunday and Indian holiday “Navratri” is just over so don’t want to give heavy dose to blog reader rather I want to brush up memory with some of my favorite and useful SQL Server function. There are hundreds of functions available in SQL Server and out of those functions I have some of my favorite functions which are part of my routine life. Now last but not least, SPLIT function. Actually we need to split values based on different separator, SQL Server doesn’t support any SPLIT function by default so I have created my own user defined SPLIT function. Click here to use the script. 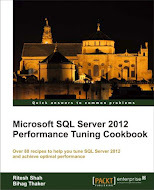 This entry was posted in sql server and tagged functions, SQL Server on October 28, 2012 by Riteshshah.